What a nice change! There were lots of rats recently in blog. Skaven this, Skaven that. Skaven everywhere. Wow, you probably won’t believe me I have plenty of other miniatures from various systems to paint, and therefore to play some day (read: as soon as I paint them:). But for some unknown reason I’ve concentrated all my efforts on on Skaven in recent days. I’ve finished my around 1250 points army in the beginning of June, and that should be enough. I should start painting something else, but right before every upcoming battle, I had this thought in my mind: oh, I must use this miniature, or this one – it’s the last one – no more. And right now, we have end of July and I’m still painting mostly Skaven… but now I promised myself (again) – that’s it. No more…I’ve cut out, primed and magnetised Blood Angels Terminators and they are ready… but right after that, I got the message from my friend asking me for re-match against his Empire – and I’ll be needing Screaming Bell for this one! Neverending story! Skaven! 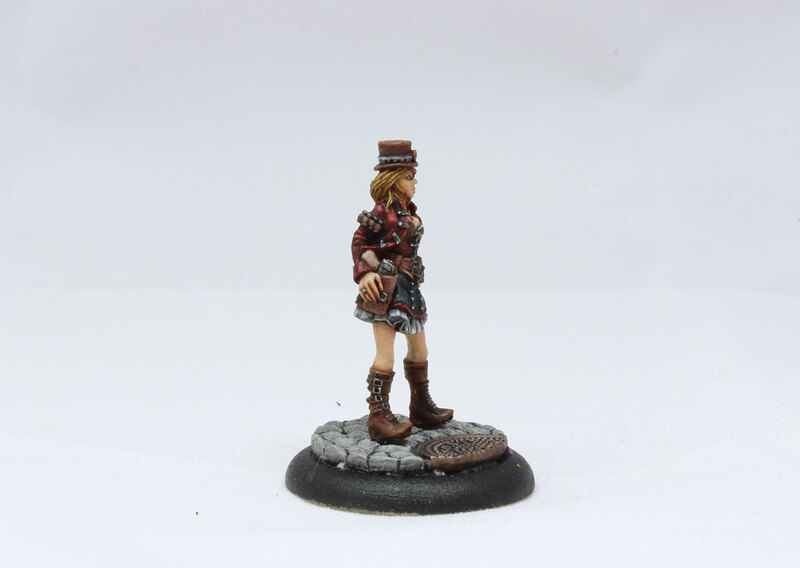 I’m little fed up with painting those – lucky for me, from time to time it’s easy to take a break and paint some nice model from other game – like for example Wolsung Steampunk Skirmish game. The models for skirmish game are more demanding – they have way more details than GW plastic WHFB models, but it’s only one mini – so it won’t take me that much time. Nice idea between all the vermin. So, when I looked at her – I just knew she will be my next;). And I will never have to borrow this miniature again:). Mary Fearless is great miniature. She looks like a true steampunk girl. Long boots, a hut, colt navy at her belt and a skirt. I’ve seen images like this in many, many places – drawings, cosplays – there are lots ogf girls dressed like that. And that’s actually great thing – I’ve painted few minis for Wolsung recently – what I’ve noticed – as for Steampunk Game – models for Ash and Oak are not very Steampunk… They look more like English Victorian style – but in traditional way, no steam, no machines or fancy guns, or cybernetic parts. I don’t have any issue here – I like they way they look (if I wanted to collect something more climatic – I would choose The Inventors as my faction for Wolsung – they have plenty of robots, machines, monkey wrenches and other stuff:) – distinguish and noble. Mary Fearless looks little bit different though than rest of Ash & Oak club, and therefore I was anticipating the moment when finally I had the chance to paint her. The story of Mary Fearless is starting in Vinland colonies. Vinland is our North America and USA in the world of Wolsung. History is similar – and here Mary Winterbough III (her previous full name) joined the rebels against Alfheim (Great Britain), and she was forced to run to Lyonesse to seek shelter. You see – she is quite different, even she is from the noble family. I took the opportunity that she is kind of US of A gal and I painted her clothes in red, white and blue. Dark red jacket (Mephiston Red with lots of Nuln Oil), dark blue skirt (Incubi Darkness) and white/grey add-ons (Administratum Grey as a base). So right now she’s like a rebel in the heart of enemy’s territory;). True fun with Mary fearless starts during the gameplay. I had this one opportunity to use her in action and it was awesome. Quick reflexes and fast accurate markswoman skills – and as every Wild West girl – she is experienced in small town or big city (like Lyonesse) street shoot-outs, so there’s hight probability enemy model will be shot just before he/she will even think to shoot at Mary. I can’t wait my next game of Wolsung – this time I’ll use my own model of Mary Fearless. Plans: Blood Angels Terminators. Finally. This Tuesday I spent some time at drilling and gluing magnets – right now I can replace all the weapons. Right now, it’s their turn. …and tomorrow I have appointed game of Warhammer Fantasy 8h Edition – with, surprise, surprise – SKAVEN against Orcs & Goblins. Expect full battle reports from this clash. She looks amazing – nice job dude! Great job on Mary here. She looks really good! Sweet work. That blonde hair is great; I too have often fallen into the trap of painting it yellow.